The Regions of Singapore are urban planning subdivisions demarcated by the Urban Redevelopment Authority of Singapore to aid in its planning efforts. Over time, however, other governmental organisations have also adopted the five regions in their administrative work, as for example the Department of Statistics in the census of 2000. The regions are further subdivided into 55 planning areas, which include two water-catchment areas. The largest region in terms of area is the West Region with 201.3 km2 (77.7 sq mi), while the Central Region is the most populous with 939,890 inhabitants in the area in 2015. While utilised by some governmental organizations, these regions are not administrative subdivisions. 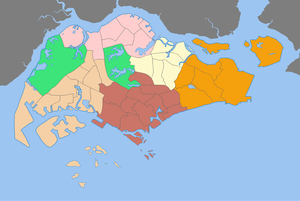 For administrative purposes, Singapore is divided into five districts and further divided into divisions governed by councils and headed by mayors. These subdivisions are incompatible with the region subdivisions. The regions are fixed over time while the districts fluctuate with electoral redistricting. ^ "HistorySG - 1991 Concept Plan is unveiled". National Library Board. ^ "Singapore Infopedia - Development guide plan". National Library Board. ^ a b c 2018 City Population - statistics, maps and charts | SINGAPORE: Regions Retrieved February 11, 2019. This page was last edited on 11 February 2019, at 14:39 (UTC).